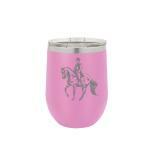 Horse gifts, Equestrian Jewelry, Engraved Nameplates, Horse Products and More! Welcome to the Horse Smarts equestrian store you will find gifts for yourself, your horse, your family and friends. We carry a large array of equestrian jewelry items. One of our most popular equestrian jewelry items is our custom engraved nameplate bracelets. You will also find items for your home such as engraved pictures frames, dinner plates, wine / beer glasses, cutting boards and more. We carry horse items such as bridles, martingales, halters and leads. Looking for horse show awards? We have a large selection of custom engraved awards available. All engraving is done in house by us which makes shipping times faster than most other companies. Custom leatherette certificate cover with personalized text and 4-H logo.